Martin Gardner continues to delight. He introduces readers to the Generalized Ham Sandwich Theorem, origami, digital roots, magic squares, the mathematics of cooling coffee, the induction game of Eleusis, Dudeney puzzles, the maze at Hampton Court Palace, and many more mathematical puzzles and principles. 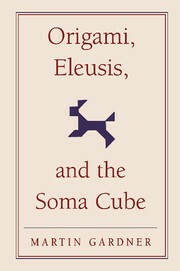 Origami, Eleusis, and the Soma Cube is the second volume in Martin Gardner's New Mathematical Library, based on his enormously popular Scientific American columns. Now the author, in consultation with experts, has added updates to all the chapters, including new game variations, mathematical proofs, and other developments and discoveries, to challenge and fascinate a new generation of readers. 1. The five platonic solids; 2. Tetraflexagons; 3. Henry Dudeney: England's greatest puzzlist; 4. Digital roots; 5. Nine problems; 6. The soma cube; 7. Recreational topology; 8. Phi: the golden ratio; 9. The monkey and the coconuts; 10. Mazes; 11. Recreational logic; 12. Magic squares; 13. James Hugh Riley Shows, Inc.; 14. Nine more problems; 15. Eleusis: the induction game; 16. Origami; 17. Squaring the square; 18. Mechanical puzzles; 19. Probability and ambiguity; 20. The mysterious Dr Matrix.